Zero-point clamping system for automation solutions for set-up-time-optimized clamping with cutting and non-cutting processing in all areas, also in the food, pharmaceutical and chemical industry. 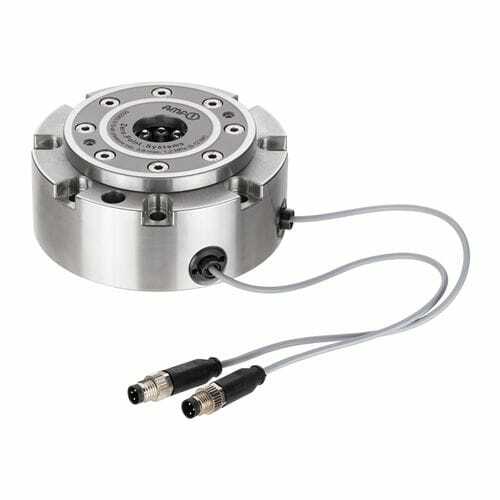 The installation clamping module with sensor monitor contains 2 inductive sensors (connection type: S8 plug, cable length: 150 mm) for condition control (open / locked). This is pneumatically opened (1) and mechanically locked through spring force. To achieve the specified pull-in and locking forces, it must be briefly retensioned pneumatically (turbo) (2). Subsequent uncoupling of the pressure lines is possible at all times (module is tensioned pressure-free). Use of the pneumatic pressure intensifier 6370ZVL is recommended. 1x pneum. retensioning (turbo) (2).